Mama Knowles is off the market! 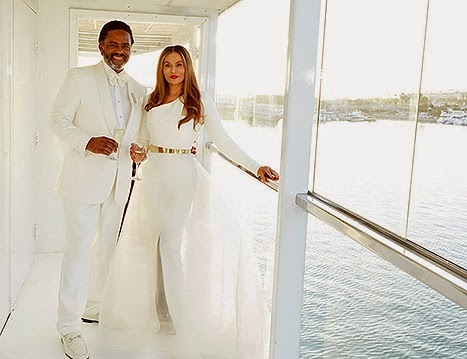 On Sunday in Newport Beach, CA Tina married her man, actor, Richard Lawson on a yacht while everyone dressed in white. Maybe she was taking a page out of her baby girl Solange's book? Knowles, 61, and Lawson, 67, have been dating since 2013. Tina divorced her previous husband, Beyonce and Solange's dad, Matthew Knowles back in 2011. Lawson is known for his roles in All My Children and The Poltergeist. His daughter is Bianca Lawson, whom you'll recognize real quick. ....He's since remarried and still owes child support to his baby-mamas....but to the Beyhive...he's dead to us.